Michael Joseph Jackson (August 29, 1958 – June 25, 2009), also known as the King of Pop, was an American recording artist, entertainer, and businessman. Jackson's death and funeral got a lot of media and news attention from all over the world. Simple: Michael Jackson is why I make music. I am sad that he died, and I will always think of what he did. He will be missed, but never forgotten. He is great, and no-one will be better than him. Simple: The first album I bought with my own money was Michael Jackson's Thriller. After I watched him on TV performing in the Grammys, I tried to learn how to moonwalk in my kitchen for two weeks. ↑ "Michael Jackson's Black or White Blues". Entertainment Weekly (November 29, 1991). Retrieved on 2009-07-03 "[A] highly placed source at MTV says the network was obligated to refer to Jackson on air as the King of Pop in order to be allowed to show "Black or White." An MTV spokeswoman denies that, but the phrase was part of MTV's ads for the video and was repeatedly used by its VJs. 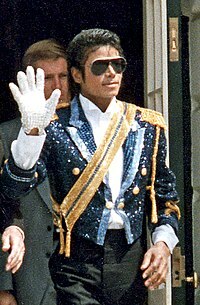 A source at Fox confirms that Jackson's people did request that Bart Simpson use the phrase "King of Pop" in the video and that the phrase also be used in the network's press releases; "King of Pop" also crops up in Fox's print ads for the video and in press releases by Jackson's publicists, Lee Solters/Roskin/Friedman." ↑ He wears the crown as the King Of Pop because no artist has broken his record of selling nearly 60 million copies of a single Album (Thriller). Lewis Jones, Jel D. (2005). Michael Jackson, the King of Pop: The Big Picture: the Music! the Man! the Legend! the Interviews: an Anthology. Amber Books Publishing, 3. ISBN 9780974977904. ↑ "Michael Jackson memorial draws 31.1 million U.S. TV viewers", Reuters, July 9, 2009.